The Balvenie DoubleWood is a 12 year old Single Malt which gains its Distinctive Character from being matured in two woods. 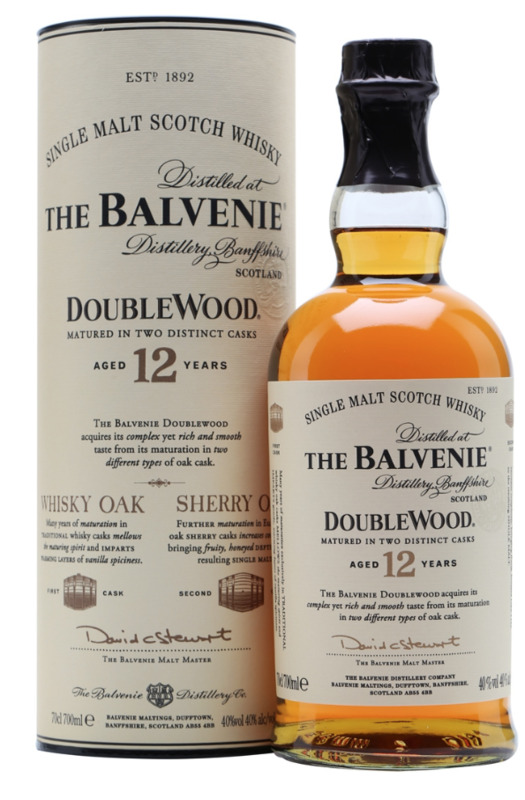 During its period of maturation The Balvenie DoubleWood is transferred from a Traditional Oak whisky cask to a First Fill Spanish Oak Sherry cask. Each stage lends different qualities to the resulting single malt- the traditional casks, having previously held Bourbon, soften and add character, whilst the Sherry Wood brings depth and fullness of flavour. Taste: A smooth and mellow single malt of beautifully combined flavours - nutty sweetness, cinnamon spiciness and a delicately proportioned layer of sherry - with a long and warming finish.